Is this the cutest bracelet you ever did see? 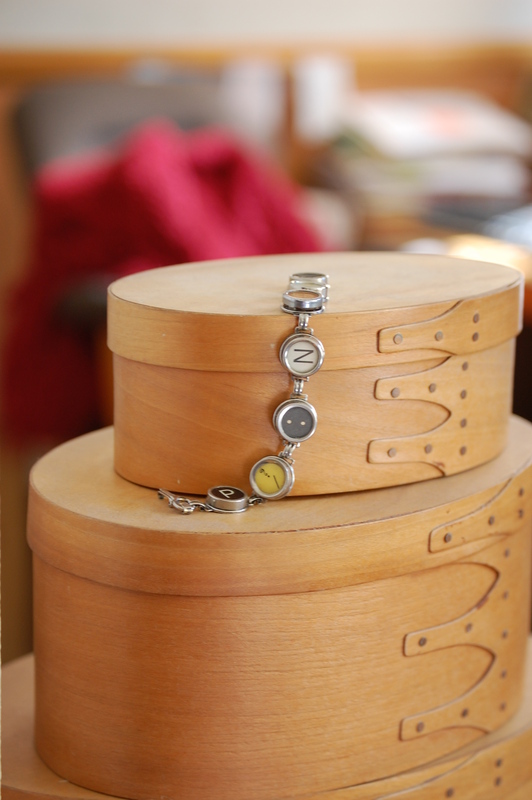 It’s made from actual recycled typewriter keys, each with a smooth silver backing. I got this particular one from JuNxtaposition. The woman who makes them there is named Jeanne, and she’s quite lovely — she e-mailed me to let me know the particular bracelet I wanted was no longer available, but she would be very accommodating about a new one. You can scroll through her site and order a very specific bracelet — seeing the exact letters, colors, or symbols you’ll receive. I ordered a couple of them at Christmas and was in a bit of a hurry to have them shipped, so I couldn’t custom-order, but that option is available, too. This entry was posted in Book Club, Life as a Writer, Reviews, Romance Writing, Writing Musings by Lauren Christopher. Bookmark the permalink. It is the cutest bracelet I ever did see! I love the idea of using old typewriter keys! The picture is great too, I like the boxes you have it sitting on! Thanks, Debi! There’s actually a whole story to that photo, but I worried it was too boring to write out. But basically my camera is a little busted because I managed to DROP IT (yes, indeedy). So the lens sometimes doesn’t sit right. And it wouldn’t let me take the picture straight down. (As if the bracelet were on a table, which seems natural, right?) So I was looking around for a place where I could “hang” the bracelet and take the pic straight ahead so my zoom lens would work. And I saw my boxes! I ended up kind of liking it because my [messy] desk is in the background, which works for me. 🙂 So thank you! I appreciate the compliment because I had to scramble to get that shot. Crystal — Sounds cute! Where did you see it? That is so pretty and sweet!